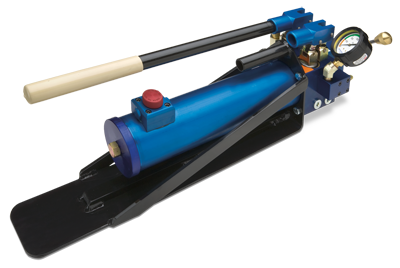 The Mustang Model 20A 2-Stage Hand Pump is provided as standard equipment with the DBM-60 and DBML-80 squeeze tools. The 2-stage design allows for a rapid advancement of the squeeze tool upper jaw by using the color-coded large piston. Once the pipe is contacted and pumping pressure builds, a simple switch to the smaller piston completes the squeeze-off with reasonable effort. A high capacity oil reservoir and built-in pressure relief valve complete the unit.